Blackjack is one of the most popular online casino games in the world. It has a long history that stretches back hundreds of years. Today you can find it being played at most casinos worldwide. It is also extremely popular online. It is popular because it is fast moving, easy to learn, and full of nuances that can take a lifetime to master. Some players who play online find it more comfortable to play with blackjack live with real dealers. For these people there are a number of casinos which feature special software to play blackjack with real dealers turning your cards and shuffling the decks. 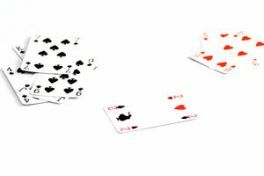 The game of blackjack is played with a full deck of fifty two cards. The jokers are not used. Each card is assigned a different point value. The numbered cards are given the same number of points that are shown on their face. For instance the 4 of spades is worth 4 points. Face cards, king, queen, and jack, are all worth 10 points each. Aces are either counted a 1 point or 11 points depending on your hand. In a nutshell, the main object of blackjack is to have 21 points in your hand and it determines the point of how to win at blackjack. If you achieve 21 points with a jack and an ace then you have an automatic blackjack, the highest score in the game. If you can't get to 21, you want to have the score closest to blackjack without going over. Regardless of the number of players at the blackjack table the only play is between the dealer and the player. Therefore, for the purposes of this explanation we will refer only to a single player and a single dealer. The player places a bet on his hand before the dealing even begins. The deal deals one face up card to the player, one face up card to himself, another face up card to the player, and a final face down card to himself. The player then decides whether he is going to hit or stand. Hit means that the player wants another card. The player can take as many hits as he wants until he busts, or goes over 21 points in his hand. Stand means that the player does not want another card. Standing is either done because the player believes that he can beat the dealer with his existing hand or because he believes that the next card will place him over 21 points. Once the player is done hitting or standing the dealer turns over his face down card. The dealer has to hit at 16 and stand at 17 regardless of the hand of the player. If the player is closer to 21 he gets 1.5 times his money back and if he loses then the house gets to keep his entire bet.